Andre Russell's power-packed inning of 49 runs off 13 balls ensured the Royal Challengers Bangalore (RCB) remains victory-less for the 5th match in a row. Chasing down a total of 206, Russel, who came at number 7, pulled out a victory from the jaws of defeat. When the Caribbean right-hander came out to bat, the KKR was facing an uphill task needing 53 runs off 18 balls. 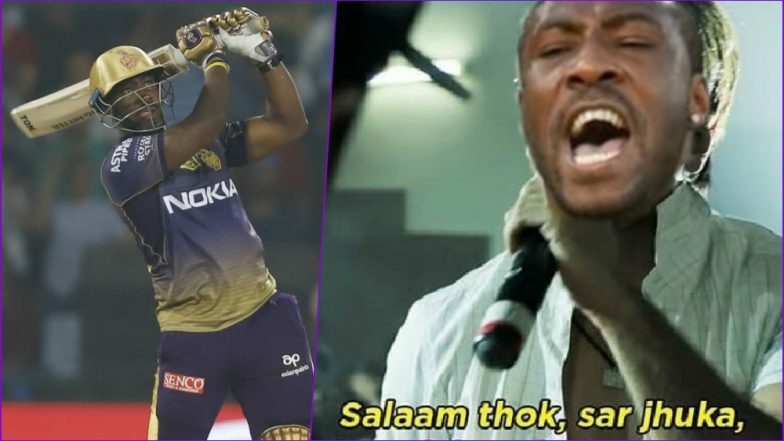 Funny RCB Memes Go Viral As Andre Russell Onslaught Shocks Virat Kohli & Co. in IPL 2019 Match 17. It was in the 19th over when Russell did the damage, smashing 28 off just five deliveries by Tim Southee. The overturned the game upside down in the Knight Riders favour, leaving them to score just 1 off the final 6. Shubman Gill did the needful by safely scoring the final run on the first ball of the last over. Catch Full Highlights of RCB vs KKR Match. Meanwhile, Russell Ka Time Aa Gaya! Nehra JI kare tou kare ka! Andre Russell : Super over ki kya strategy hai? With this loss, RCB has plummeted to the bottom of the points table (they were already there). A recovery from here -- into the playoffs -- would require a victory in 8 of the 9 remaining matches. While, the KKR, with this victory, has surged to the second spot on the points table, with 6 points of the 4 matches played so far.